OpenFL contains Haxe ports of major graphical libraries such as Away3D, Starling, BabylonJS and DragonBones. Due to the multi-platform nature of OpenFL, such libraries usually run on multiple platforms such as HTML5, Adobe AIR and Android/iOS. OpenFL is designed to fully mirror the Flash API. SWF files created with Adobe Flash Professional or other authoring tools may be used in OpenFL programs. OpenFL supports rendering in OpenGL, Cairo, Canvas, SVG and even HTML5 DOM. In the browser, OpenGL is the default renderer but if unavailable then canvas (CPU rendering) is used. Certain features (shape.graphics or bitmapData.draw) will use CPU rendering, but the display list remains GPU accelerated as far as possible. OpenFL uses the Lime library for low-level rendering. Lime provides hardware-accelerated rendering of vector graphics on all supported platforms. Lime is a library designed to provide a consistent "blank canvas" environment on all supported targets, including Flash Player, HTML5, Microsoft Windows, macOS, Linux, iOS, Android, consoles, set-top boxes and other systems. 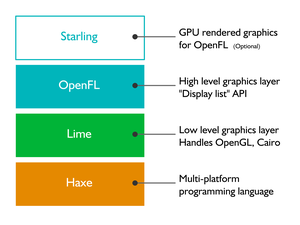 Lime is a cross-platform graphics, sound, input and windowing library, which means OpenFL can focus on being a Flash API, and not handling all these specifics. Lime also includes command-line tools. Haxe is a high-level cross-platform multi-paradigm programming language and compiler that can produce applications and source code, for many different computing platforms, from one code-base. It is free and open-source software, distributed under the GNU General Public License (GPL) 2.0, and the standard library under the MIT License. Haxe includes a set of common functions that are supported across all platforms, such as numeric data types, text, arrays, binary and some common file formats. Haxe also includes platform-specific application programming interface (API) for Adobe Flash, C++, PHP and other languages. The Haxe port of the Starling Framework runs on Stage3D and supports GPU-accelerated rendering of vector graphics. It uses a custom Stage3D implementation, and does not required the OpenFL display list to work. ^ a b c d "Introducing OpenFL". Joshua Granick Blog. Archived from the original on 2014-10-02. ^ a b "openfl.org". Archived from the original on 2014-10-26. ^ "LICENSE.md". Github. Archived from the original on 2017-03-30. ^ "README.md". Github. Archived from the original on 2015-08-13. ^ a b c Doucet, Lars (2014-03-18). "Flash is dead, long live OpenFL!". Gamasutra. Archived from the original on 2015-08-30. ^ "OpenFL ReadMe". Github. Archived from the original on 2018-04-27. ^ "openfl/openfl". GitHub. Archived from the original on 27 April 2018. Retrieved 27 April 2018. ^ "Home > Away3D". away3d.com. Archived from the original on 19 November 2010. Retrieved 27 April 2018. ^ "Showcase". www.openfl.org. Archived from the original on 26 December 2017. Retrieved 27 April 2018. ^ Doucet, Lars (2015-06-03). "Haxe/OpenFL for home game consoles". Gamasutra. Archived from the original on 2015-09-08. ^ "Haxe Interview". Io Programmo. 2009-04-01: 1–6. Archived from the original on 2015-12-08. ^ Grden, John; Mineault, Patrick; Balkan, Aral; Hughes, Marc; Arnold, Wade (2008-07-16). The Essential Guide to Open Source Flash Development. Apress. p. Chapter 9 (Using Haxe). ISBN 1430209941. ^ "Hello Lua! - Haxe". Archived from the original on 2016-08-06. Retrieved 2016-07-09. ^ "hxnodejs (4.0.9)". Archived from the original on 2016-06-18. Retrieved 2016-07-09.